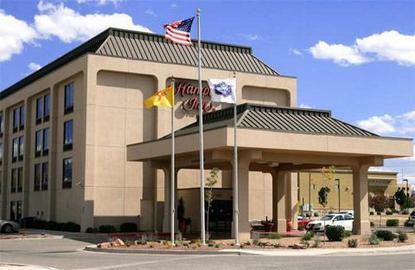 Hampton Inn Albuquerque University/Midtown (UNM) is located in the heart of the city just off I-40 (Exit 160). Located just 5 miles north of the International Sunport, it is a quick trip to downtown Albuquerque's exciting nightlife and historic Old Town. Area attractions include the University of New Mexico, the Indian Pueblo Cultural Center, casinos , shopping, and the one-of-a-kind Sandia Peak Tramway. If all of this activity makes you hungry, there is a world of cuisine within one mile of our property. From authentic French to good old American food, there are endless dining choices for guests of the Hampton Inn University/Midtown.